Schizura concinna — “Red humped caterpillar” | Welcome, visitor! Schizura concinna, the “red humped caterpillar” is a moth from North America that has a very large range spanning from Canada to Florida. They are mainly found along the east and west coast but can also be found more landinwards. 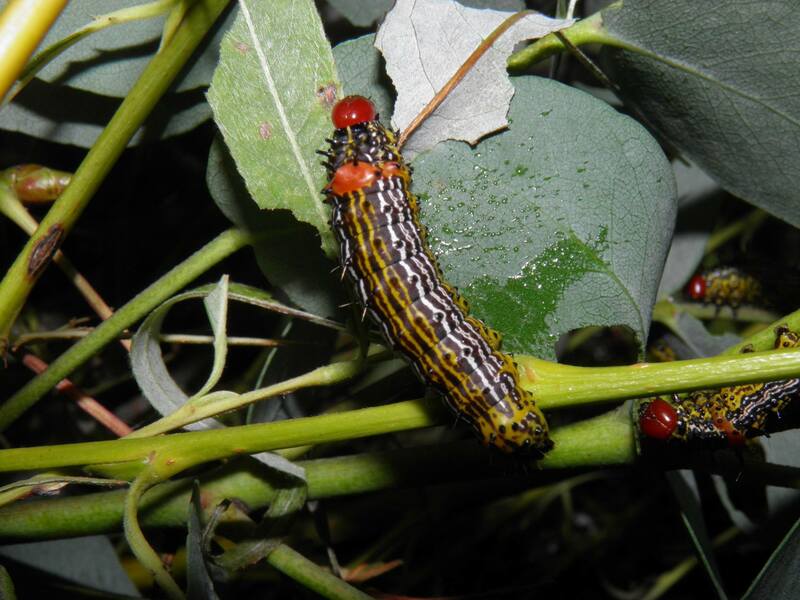 Their name is due to their caterpillars; the larvae have a typical “red hump” on their back and live and feed together, in groups. 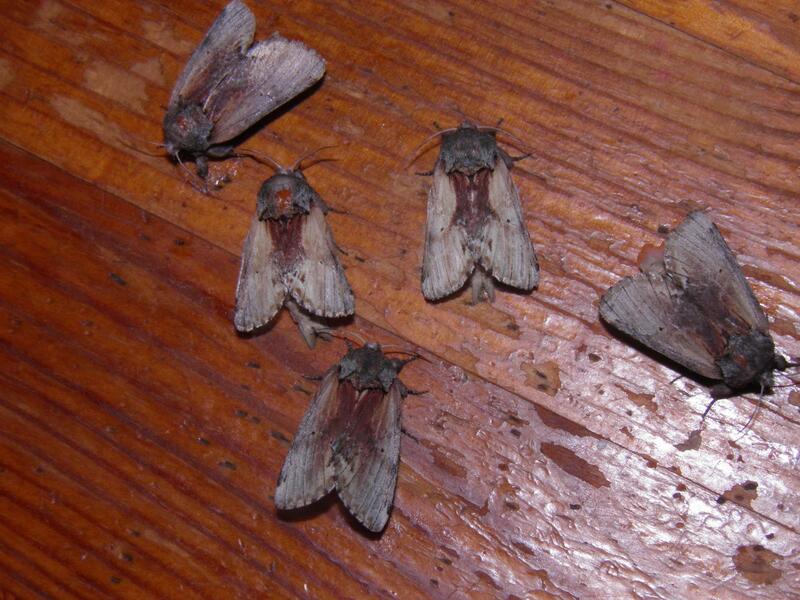 In large numbers this species can defoliate trees. Host plants: Many Rosaceae; Prunus sp. (such as cherries, apple, plum, apricot), Eucalyptus, Liquidambar (sweetgum), Salix (willow), Rubus (bramble), Juglans (walnut), Populus (cottonwood) and many more. Pupation: Does not always spin a cocoon to pupate, but they can. Schizura concinna is very easy to breed in captivity. The larvae, that are mostly social, develop stunning psychedelic looking colour patterns and are so polyphagous that they can eat nearly anything you will throw at them. They seem to tolerate being reared in high densities without getting sick, even the more solitary final instars, and can stand neglect and suboptimal conditions. The colourful caterpillars are in great contrast to the adults, that seem to be quite variable but that seem to have darker shades of grey, silver and brown and are thus well camouflaged in woody environments. 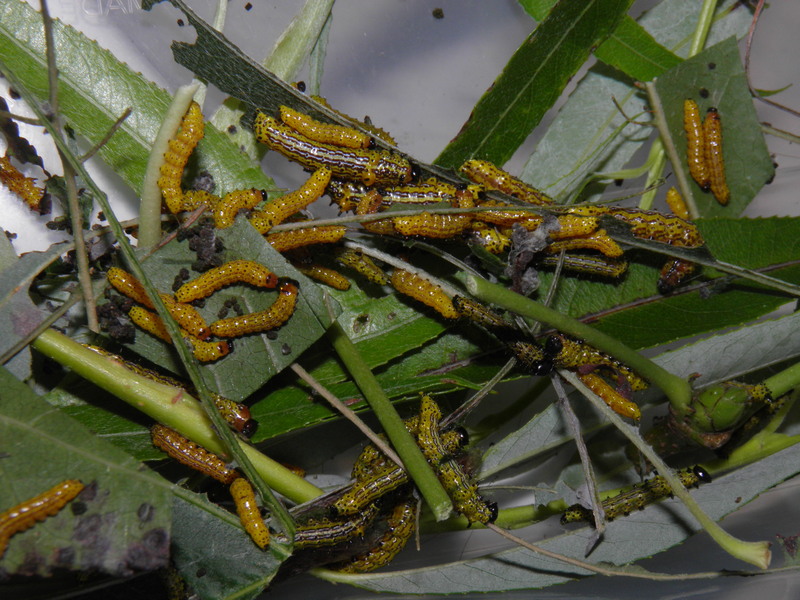 The newly hatched caterpillars can be reared in small airtight plastic containers. 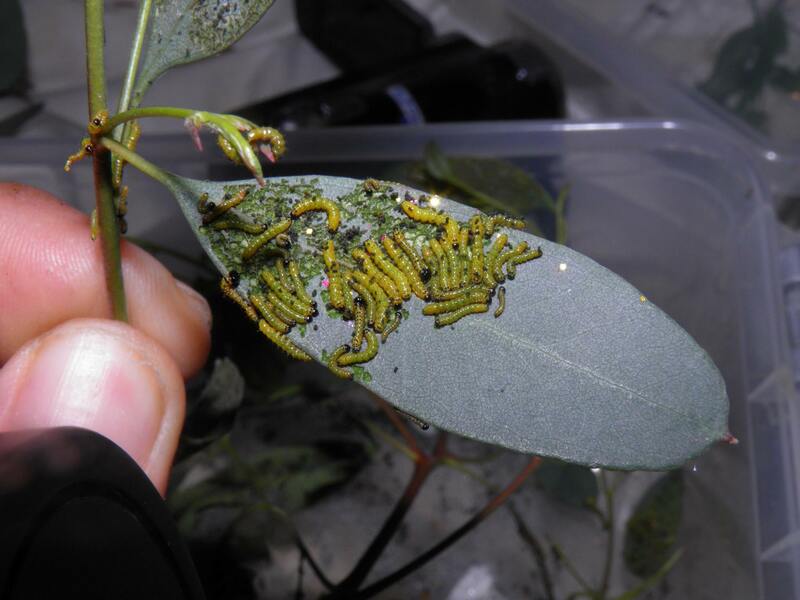 After hatching they will assemble in groups; the young larvae (the first instars) seem to have a habit of skeletonising the leaves they feed on, leaving the veins and a part of the leaf membrane intact so they can still walk over it. They will however quickly lose this habit, for the older caterpillars consume the leaves whole. They are easily reared on Liquidambar (sweetgun), Eucalyptus or any kind of cherry (Prunus, but with a preference for the deciduous species) and willow (Salix). The most notable thing about Schizura concinna is their smell. For this reason, not everybody may enjoy rearing them – it can be described as a very sharp, obtrustive, piercing acidic smell that is similar to vinegar and mustard. The reason for this is that the larvae have glands that secrete a defensive chemical that mainly consists of formic acid and several kinds of acetate. In fact, if stressed or handled too roughly, the caterpillars may empty their gland, and seem to “explode” into a sticky mess, dousing themselves in this chemical and also spraying it around. This foul smelling and tasting liquid mainly serves to make them unpalatable to potential predators who may change their mind about eating a thing with such horrendous taste and smell; however, if somehow gotten into the eyes, formic acid can also produce an excruciatingly painful and blinding effect. Therefore it is advisable to keep larvae away from the eyes and to wash your hands after handling them. Although the chances of this happening are low, one should be mindful that the larvae can spray droplets of this liquid if they are stressed, although only for a very short distance. a Schizura concinna; excreting a defensive chemical. While it mainly seems to leak from their body, also note the tiny droplets below the thorax that show how the larva has “sprayed” the chemical. Formic acid is common in insects such as in certain types of ants, beetles and more but a large number of Notodontidae also excrete it. They can be reared in nearly any sort of container, although a bit of ventilation is welcome. Do keep in mind that the caterpillars have a strong scent and rearing them in an open ventilated container may fill the whole room with their “vinegar” like smell. If you replace the food plant often to keep it fresh and remove droppings before they go moldy, they will make for an interesting and easy breeding. Love them or hate them, they do make a significant ecological impact and are an intersting species to study. A large batch of Schizura concinna together in one container. The caterpillars are fully grown in about 1.5 month time, and the moths likewise emerge from 1 to 2 months time from their cocoons; although curiously I also had a few latecomers that hatched after 4 months time, so that indicates they can take their time if they want to. Their pupating habits are interesting. When the larvae are fully grown, they spin cocoons between leaf litter or soil, in some cases hiding or burrowing in a good spot. 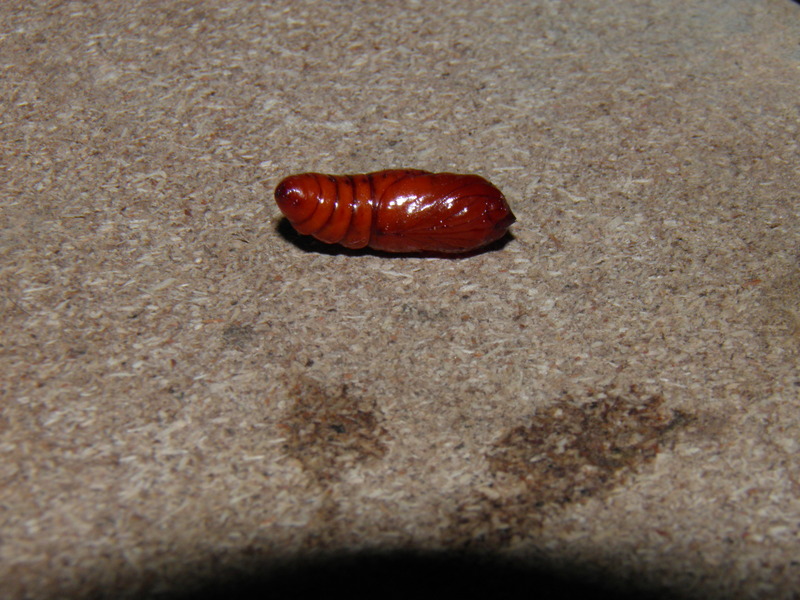 A few larvae will spin no cocoons at all and just pupate. Depending on the lighting and temperature they have been reared in, the caterpillars in the cocoons may decide to overwinter or not: in the right conditions, if kept warm and humid, they will produce continuous generations in captivity with no need to overwinter. When they do decide to overwinter, the caterpillars do not pupate in their cocoons! 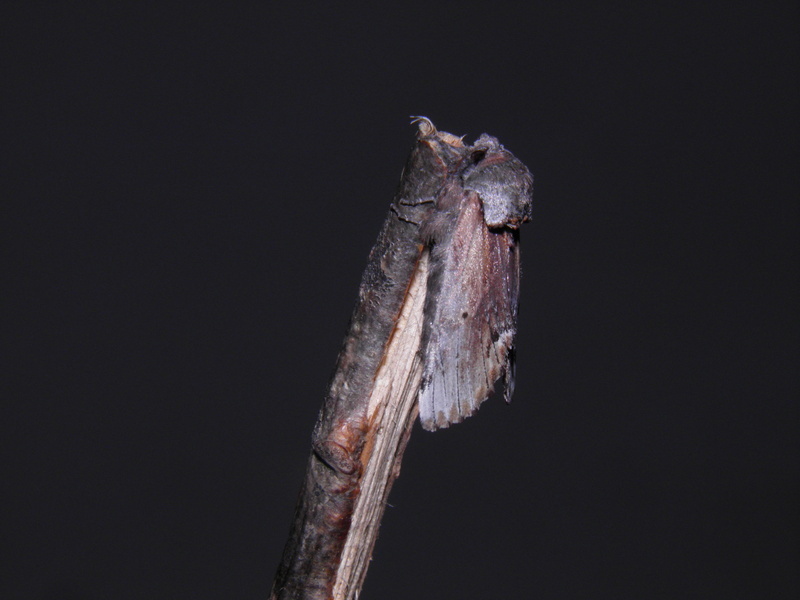 This species overwinters as a prepupa, and larvae can spend many months as prepupae in their cocoons, until they feel the time to pupate is right, upon which the moth emerges from the pupa usually in about 1.5 month time depending on temperature. Upon hatching, the adults live for about a week. Pairing them is very straightforward and easy. They will even pair in very small plastic containers that are airtight. 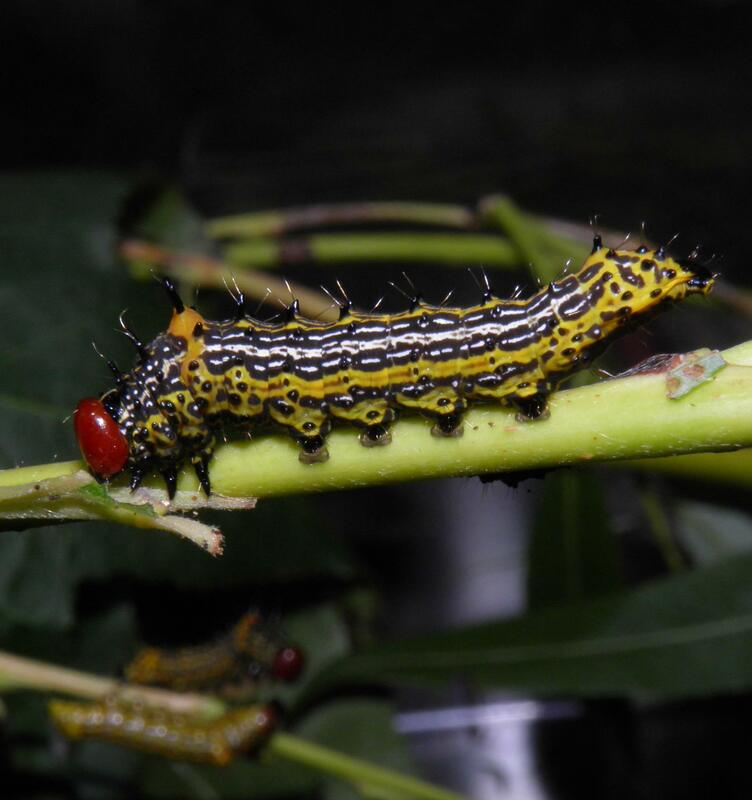 In fact, since the eggs are extremely small, placing them in tiny containers is easier than placing them in larger moth cages; after pairing, it will be easier to locate all the eggs. They prefer to lay eggs on rough surfaces and not so much on plastic, including some paper towels or sticks will help with this. The eggs hatch in about two weeks; they are tiny and pale yellow. Silkmoths of Indonesia A great website about the wild silkmtoh species of Indonesia by Ulrich & Laela Hayati PAUKSTADT; authorities on the subject.